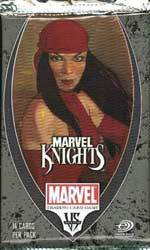 The new Marvel Knights expansion is composed of 220 cards designed to enhance game play. It features popular characters from the Marvel Universe, including Daredevil, Elektra, Blade, Ghost Rider, and the Punisher. The set also showcases the many heroes and villians of the Marvel Universe, along with new characters from teams introduced in the previous tcg expansions, Marvel Origins and Web of Spiderman.